and versatile Isabella mothers bracelet is perfect for everyday wear. Topaz gemstones are very clean to the eye with very slight internal characteristics. Each Isabella Mothers Bracelet is created by hand based upon your personal request. 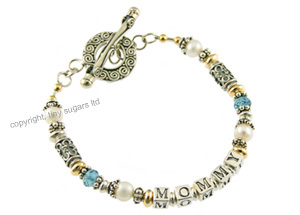 number of letters in your personalized jewelry design.